The Hermetic Maxim: As above, so below; as within, so without; as the universe, so the soul, has evolved from the details of the Emerald Tablet, attributed to Hermes Trismegistus. 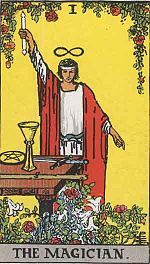 Hermes was considered "thrice great", for having attained knowledge of Alchemy (the operation of the Sun), Astrology (the operation of the stars), and Theurgy/Divine Magic (the operation of the gods). Astrology works with the horoscope, a symbol of transformation. It is a mandala, a circle, a whole. Wholeness is an integrating principle in the process of individuation, and wholeness begins with the inner exploration of the soul, that uniquely personal factor that includes the mind, the emotions, and the actions-based will. The Hermetic Formulary addresses wholeness this way: body, soul, and spirit; Ascendant, Moon, Sun.